Noe Noe Girl is the coolest little Chica you will ever meet. She's sassy, funny, and she has some of the biggest hair I have ever seen! **Jealous** Her energy level knows no bounds. She and her husband BUILT THEIR OWN HOUSE. Not kidding! 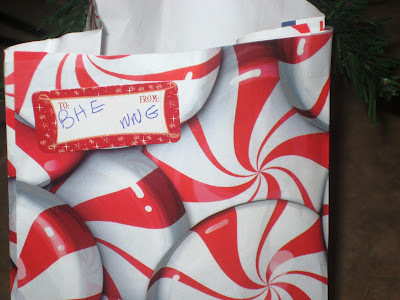 When I opened the gift, I could hardly contain my excitement!!! Isn't it obvious that she TOTALLY "gets" me??? That has to be the most perfect gift - EVER!!!! What a hoot! That is so perfect and tacky! The worst hairspray under the sun! I can only imagine the fun you guys had. How funny! I have not seen that stuff in ages. That is so cute. Such a sweet gift...just don't spray it in church...what with all the sunday candles going and all...you could wind up on the 5:00 news. You know it worked for me! My mom once bought me a case of it for Christmas...I had a can a day habit at that time! 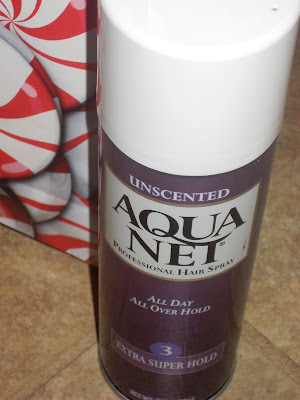 I have such fond memories of Aqua Net. Seriously, it reminds me of both my grandmother and my high school days! I'm soooo glad you liked the gift chickie! And now that I know how excited you were...next year I'm gonna get you two cans! How many cans of that could I go through? A Lot! What an awesome surprise and so perfect for you! I miss and loce you so! I am hoping that your holidays are wonderful! I am trying to work on a plan to be back among the blogging world on a more consistant basis soon!!! Pray for me! I used the pink can of Aqua Net in high school. Loved the stuff! Is there a warning on the can that says "outdoor use only"? She definitely knows you, BHE! A sign of an excellent friendship, for sure! She sounds like a blast and like what everybody's BFF should be like! Just came across your blog and think it's great! And it's even SUPER HOLD!!! BONUS! Oh my gosh! This is so funny : ). She totally gets you! I am glad you can overcome your jealousy of her big hair and still be friends : ). She seems lovely. She has been popping in to my blog to say hi! I always love a new friendly blogger! Welcome Noe Noe Girl! OK, next limo ride y'all need to mosey on over here. The fact that those two built their own house together and did not divorce is a testament to their love, that's all I can say! Oh, and the Ben Franklin...what memories I have of that place. Ours in the courthouse went out of business years ago, but my Lord MANY a CHEAP Christmas gift was purchased thre by the Chesapeake BAy Sisters for their parents and grandparents, much to their chagrin. LOL! Sounds like the best gift ever. Isn't it the BEST when you find someone who just "gets" you!? I didn't know they even still made Aqua Net.........my hubby would just crap if I ever went back to my big hair days!! I didn't know they still made it! Nothing like a friend who get you...and who blogs! Holy Crap Batman! I was not ready for that. She sounds FABULOUS! I am running to her blog now! Thanks for the laugh! Sounds like you have great friends--I can just picture the limo ride and big hair!